Definition: The Expansion through Internationalization is the strategy followed by an organization when it aims to expand beyond the national market. The need for the Expansion through Internationalization arises when an organization has explored all the potential to expand domestically and look for the expansion opportunities beyond the national boundaries. But however, going global is not an easy task, the organization has to comply with the stringent benchmarks of price, quality and timely delivery of goods and services, that may vary from country to country. International Strategy: The firms adopt an international strategy to create value by offering those products and services to the foreign markets where these are not available. This can be done, by practicing a tight control over the operations in the overseas and providing the standardized products with little or no differentiation. Multidomestic Strategy: Under this strategy, the multi-domestic firms offer the customized products and services that match the local conditions operating in the foreign markets. Obviously, this could be a costly affair because the research and development, production and marketing are to be done keeping in mind the local conditions prevailing in different countries. Global Strategy: The global firms rely on low-cost structure and offer those products and services to the selected foreign markets in which they have the expertise. Thus, a standardized product or service is offered to the selected countries around the world. 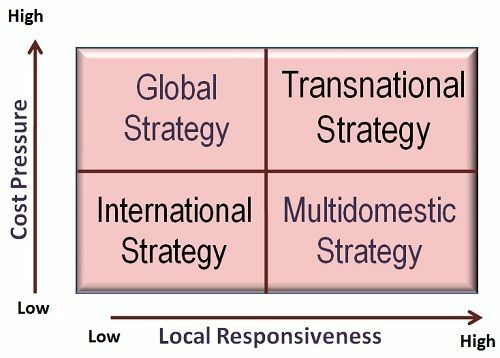 Transnational Strategy: Under this strategy, the firms adopt the combined approach of multi-domestic and global strategy. The firms rely on both the low-cost structure and the local responsiveness i.e. according to the local conditions. Thus, a firm offers its standardized products and services and at the same time makes sure that it is in line with the local conditions prevailing in the country, where it is operating. So, in order to globalize, the firm should assess the international environment first, and then should evaluate its own capabilities and plan the strategies accordingly to enter into the foreign markets.